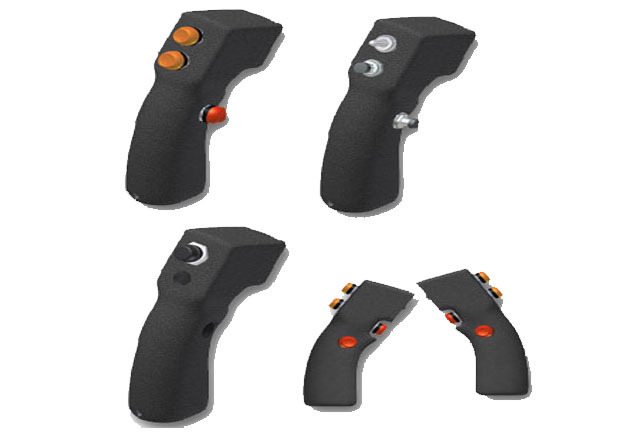 The Model 8501-RB Handy-Grip offers very powerful features in a small, low cost rugged control handle built to the same high industrial standards as our other Handy-Grip handles. The Model 8501-RB was designed for the heavy-duty Industrial equipment that doesn't require a lot of switches. We can supply two of our long-life (10,000,000 Cycle) Thumb-Operated Pushbuttons with an additional two Finger-Operated Trigger Switches. The second Trigger can be easily located, by the operator in the field, for Right or Left hand Operation.